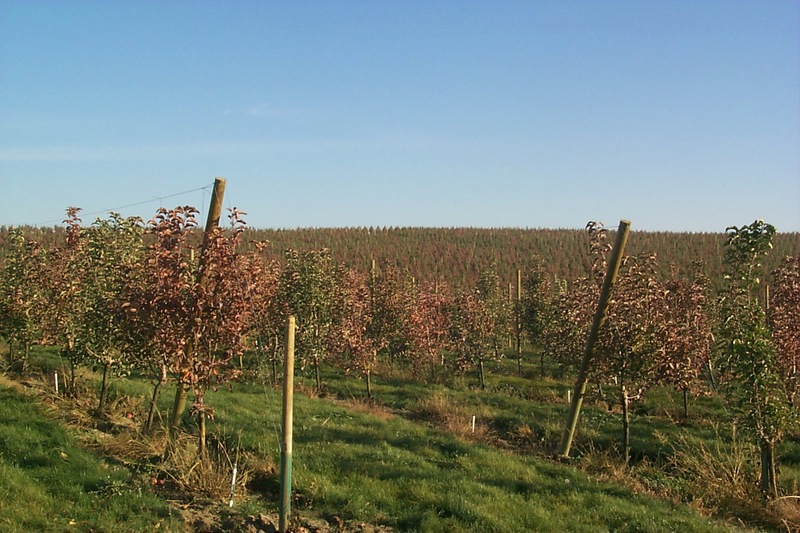 Organic tree fruit growers face a dilemma. The disease fire blight, caused by the bacterium Erwinia amylovora, can infect apple and pear trees primarily through their blossoms during the flowering period when the bacteria are present and the weather conditions are right. It is a disease native to North America that has spread to other continents as well. Currently, there is no available diagnostic tool to determine the presence of the bacteria, although a molecular method called LAMP is under development. As a result, growers rely on disease models to inform their management decisions. In Washington, the COUGARBLIGHT model developed by Tim Smith at WSU Extension is the standard tool used. The most common and effective treatment for fire blight in the state is the antibiotic oxytetracycline. When timed properly, it kills the bacteria in the blossoms before they are able to infect the tree. Once infected, the only response is pruners or chainsaws, as no material can control the bacteria inside the tree. And depending on cultivar, tree age, vigor, and other factors, fire blight can kill limbs, trees and entire orchard blocks. It is a disease to take seriously. Unlike human use of antibiotics, where we wait until we are sick (infected) and then take the medicine to cure, treatment of fire blight is primarily preventative and based on probability of infection. When the national organic standards were first adopted, antibiotics were not allowed for use in organic agriculture except for one situation: the control of fire blight in organic apples and pears. They had been used by organic growers under previous organic standards. The two registered materials, streptomycin and oxytetracycline, were both placed on the National List of Allowed Synthetics, reviewed during the sunset process in 2006 with their listing continued, and then slated for expiration by subsequent actions of the National Organic Standards Board. Interestingly, the materials were first classified as natural substances. They technically are natural, both coming from naturally occurring soil microorganisms. Antibiosis is rampant in the soil ecosystem; it is one of the main weapons in the on-going battle for survival among soil microbes. We make these antibiotics for medical purposes by growing the organisms in a laboratory in an artificial medium, and then extracting the desired compounds. For this reason the organic standards now classify them as synthetic materials. The total area of organic apples in Washington has grown over 700% since 1997, when pheromone mating disruption became available and solved a major pest management problem, namely codling moth, for organic growers. They were able to use antibiotics when needed for fire blight, so the disease was not a barrier. Without the antibiotic allowance, it is unlikely we would have seen anywhere near the amount of expansion, given the risks growers would have taken. Since the late 1990s there has been extensive work on developing biological controls for fire blight, but with limited success. Until very recently, no material exhibited the same consistency and efficacy of control that an antibiotic did. And, ironically, some of the biocontrols worked by producing their own antibiotics that partially controlled the disease. A research project on organic fire blight control is underway and is now showing promising results in test plots. It seems likely that within a few years a reliable method for non-antibiotic control will finally be available. But oxytetracycline is set to expire in 2014. If new controls are not widely tested under grower conditions and the materials both registered for use and readily available to purchase, what might growers do? According to surveys I have done, some 90% of growers are likely to reduce their acres of organic apples and pears, or exit organic production of these crops altogether. This is significant, since Washington is the primary supplier of these products for the U.S. markets. And fire blight is a worse problem for growers in most other parts of the country. Meanwhile, many consumers believe that antibiotics cannot be used in organic agriculture. They may also think that no sprays are applied, that no pesticides are used, and that there are no residues of any sort allowed on organic foods. None of these perceptions are accurate; they may be true for certain crops from certain farms, but the organic standards describe in detail how these issues are handled. Unfortunately consumer misperceptions lead to knee-jerk reactions when they hear “antibiotics in apples” without understanding the full story. Antibiotics are under heavy scrutiny due to what appears to be excessive use in livestock production (not organic), and in my opinion, ubiquitous antibiotics originating in products like hand soap. We are selecting for resistant bacteria in a number of ways. Studies on the fate of antibiotics used for fire blight control, however, show generally rapid breakdown in the environment due to sunlight, microbial degradation, and other pathways. A recent study from Wisconsin found that orchards never treated with antibiotics had a higher frequency of microbes with antibiotic resistance genes than orchards that had been treated for 10 years continuously. Thus, just like antibiotics, antibiotic resistance genes are natural and probably quite common. There is no scientific evidence linking use of antibiotics in orchards to increased antibiotic resistance in human pathogens. Few human pathogens are found in the tree blossoms. Since the trees are treated during bloom, before fruit are formed, and since oxytetracycline is not systemic, the likelihood of residues on harvested fruit is extremely low. Recent residue testing on fruit from seven orchards found no detectable residues at a limit of quantification of 10 ppb using the very sensitive method, LC/MS/MS (data not yet published). And orchards are not treated every year. Data on oxytetracycline use on Washington apples from the USDA show that on average 10.5% of acres were treated each year from 2001-2011. So the majority of fruit is not treated in the first place. 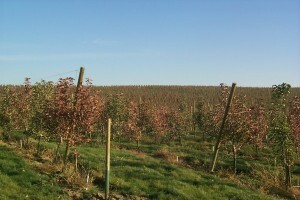 And in Washington, relatively few orchards are treated with streptomycin. Thus, statements like those made on the Organic Consumers Association website: “Every time you eat an organic apple or pear, you expose your gut flora to measureable levels of streptomycin and tetracycline. This increases your chances of developing resistance to these important antibiotics, both of which are essential to treating human disease.” are patently false, as every apple or pear is not treated every year, nor are there likely to be residues even if the orchard was treated. Statements such as this DO, however, raise the alarm and create an unwarranted sense of fear among consumers who purchase organic products without fully understanding the rules that govern the label. This turns out to be a complex and emotionally charged issue, though to me the options are clear: either allow the on-going research to proceed to completion and allow growers time to pick up the new techniques, or cut off the use of the currently most reliable tool, probably decrease the production of U.S. organic apples and pears, and increase imports from Chile and Argentina where the disease does not exist. 3 thoughts on "Treating Tree Fever"
David, thanks for this clear explanation of the stakes as the NOSB meets next week in Portland. I have tracked pesticide residue data from governments around the world over a long career, and also have had a chance to review a small mountain of privately funded pesticide residue data. I have never seen a SINGLE sample of any crop that tests positive for oxytetracycline, or any antibiotic. The reason is pretty clear — they are sprayed early in the year, and almost never come into contact with the harvested portion of a crop. Resistance to antibiotics among common human pathogens is a huge, huge issue, and one which agriculture bears some considerable responsibility — but not from crop uses. Reliance on continuous use of low-doses of antibiotics to keep animals healthy and growing in concentrated animal feeding operations has been an important well (source), if not the main well, of newly resistant bacterial genes that find their way into the human population via many different routes. The fact that organic livestock production contributes ZERO to the problem of antibiotic resistant food borne pathogens with roots on the farm is one major reason for consumers to seek out organic animal products whenever available and affordable. Thanks for the response, Chuck. I was led to believe that antibiotics were not part of the normal pesticide screen done for domestic or imported fruit. Do you know of any routine testing that has been done? I did find one paper from Austria showing that streptomycin treatment at bloom led to some residues at harvest (Mayerhofer et al., 2009). My understanding is that streptomycin can move into the plant and move around, while this is not the case with a sprayed-on oxytetracycline. A review of some of the literature on this is posted at http://www.tfrec.wsu.edu/pdfs/P2632.pdf. Fortunately, I see that the current research on non-antibiotic control, along with recent developments, is showing promising results at least for the Pacific Northwest. And over time, I am confident that equally effective alternatives will be available. However, I also understand the risk that fire blight poses to a grower and thus with their concern for the loss of a known and reliable tool versus new materials and strategies that are yet to be fully proven under a variety of conditions. It has been relatively low risk for organic growers to participate in the European Union certification where antibiotics are not allowed, since the fall-back in a bad infection year would be use of antibiotics, loss of EU status, but retention of organic status. If antibiotics are no longer allowed without a suitable replacement option, then the fall-back will be exiting organic production for that block, which is a much bigger penalty, but probably a reasonable risk management strategy for many growers.